Do they feel thin or odd compared to the double convex stones you've used? I have a set of double convex yunzi, and am quite curious. Well they don't feel thin to me. The plastic stones I had were double convex, but they were super thin, so these are actually a little thicker. My friends double convex stones were waaaay thicker, i actually found them a bit too thick for my taste, which is why i wanted to try single convex. It does take a little bit getting used to the flat side though. They dont feel odd to me to hold them, but there were times when i'd accidently play a stone upside down and be like *whoops* and have to flip it back over , but after a few days i got used to them and it doesnt happen anymore. I really like this location, it's quite tranquil. I think I jumped a bit late into this forum but decided to post anyway . Sorry about the size of the pictures, my camera takes them large and I'm not quite sure how to shrink them. Edit: Check lemmata's post for pictures. Last edited by Erythen on Mon Jan 28, 2013 4:05 pm, edited 3 times in total. Another way to make the pictures compact, until you click them, would be to use "Hide" tags from the compose editor. Is anyone having trouble seeing the pictures in this page? My browser sputters, and never seems to be able to open them. I get the "image unable to load" graphic instead of any image. Edit: Oh, wait, they're loading now. Those are huge pictures! The kyosoku, pillows and equipment came from Japan. Mr. Bozulich and Kuroki-san were very helpful in finding good equipment (both highly recommended!). The arrangement was inspired by the Yugen no ma. As for seiza...well depending on the day I can manage between 20 - 60 minutes though I usually just sit on my side and lean again the kyosoku (much more comfortable). Nope It wouldn't be the first time someone preferred a chair. Though I find leaning against the kyosoku (arm rests) to be more comfortable anyway. Thank you, I didn't even think about that! Erythen, your setup is beautiful. 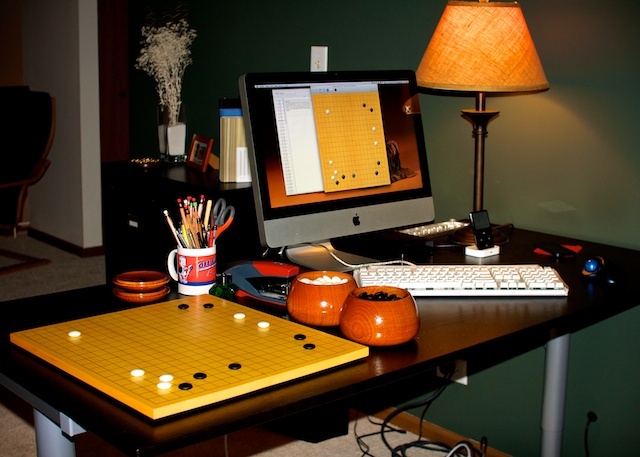 It would be nice to have go friends over and play while chatting over the board. EDIT: I shrunk Erythen's photos and put them in hide tags below so that people can check out his nice setup more easily. I hope this works... My dining room table got drafted to be my go area. We never eat there anyway, so that's all get used for. I couldn't help notice that you are in Shanghai. Just wanted to let you know that we have an international Go club here. Maybe we have already met? Anyways, send me a pm if you want to be included in the mailing list. Last edited by Mage on Sat Apr 13, 2013 8:45 pm, edited 1 time in total. Mage, is that your hyugakaya board? It's very pretty. And Kuroki bowls and Kuroki slate and shell stones? there may be a "signature" character/logo of the crafts-person.